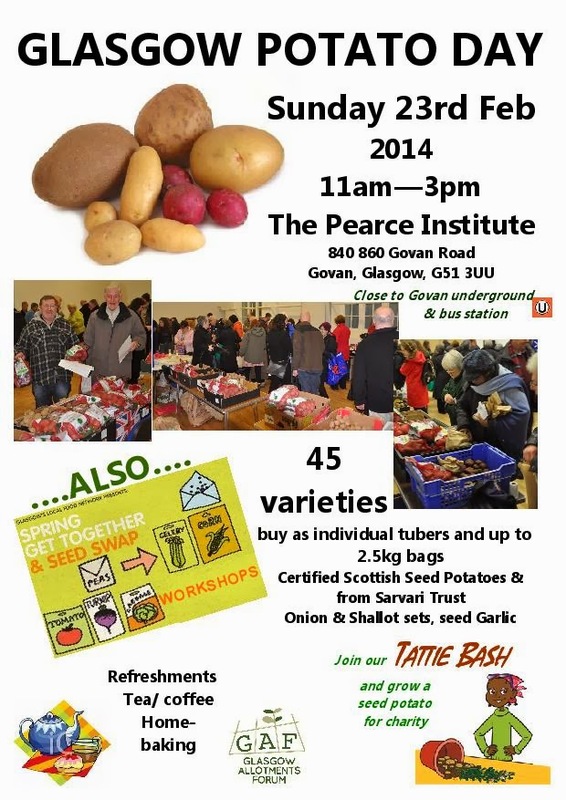 Once again the Glasgow Local Food Network are teaming up with the Glasgow Allotments Forum to run the Potato Day and Seed Swap which will take place from 11am to 3pm on Sunday 23 February at the Pearce Institute in Govan. GAF will order in sackloads by the tonne of loads of different varieties, from the household names to the uber-obscure. GLFN will host a seed swap table, starting with donations from kosher seed companies - but really we want you to bring your locally saved good seed stocks to swap and share with other local growers across glasgow. There will also be a programme of workshops throughout the day for sharing skills and knowledge. You can find out more about the Potato Day including a wee bit of background, details of the suppliers who will be coming along and a full price list of seed potatoes and other things that will be available on the Glasgow Allotment Forum website. See-d you there! Are you planning a Potato Day in 2016, if so what are the details?